DEADLINE: To fly any patches, your One- or Two-Patch Plan must be received and approved by NCESSE via email by 5:00 PM Eastern Time (USA), October 10, 2014 (see below). In this spirit, and continuing the tradition of SSEP on the final flights of Space Shuttles Endeavour and Atlantis, we’re providing the opportunity for you to conduct an art and design competition across your community—for a large number of students—to create a Mission Patch—a paper 3.5-inch x 3.5-inch square emblem that captures your SSEP experience. We will then fly your Mission Patch in space as part of the payload containing your experiment, and it will be returned to you embossed with a certification stating that it flew in space. The mission patch competition is also an opportunity to keep community-wide excitement alive post experiment selection while we’re all waiting for launch, and a means to extend the program in an interdisciplinary manner to engage, e.g., classes in art and design, and history. While the mission patch competition should be open to at least the students participating in the SSEP experiment design competition— which is limited to grades 5-16—we strongly encourage each community to broaden participation by opening the mission patch competition to wider student involvement across grades K-16, to classes beyond STEM disciplines, and to student groups across your community—even the community beyond your school. The idea is COMMUNITY ENGAGEMENT with hundreds to thousands of your students given the opportunity to participate. You should view the mission patch competition as one way your entire community can celebrate involvement in this program, and become aware of your student scientists designing real microgravity experiments for the International Space Station. Each community will set a deadline for receiving mission patches from their students, and define its own process for selecting the winning patch. 5:00 PM ET, April 15, 2015, is the deadline for the National Center for Earth and Space Science Education to receive the winning mission patch from each community. We want to encourage each community to reach out to grades K-4, and to those students in the greater community that might not be participating in the experiment design competition. We will therefore fly up to TWO mission patches per community. But the idea is to give two different student groups the opportunity to have their own competition, as a means of broadening engagement. The intent is not to have a competition for a single group and fly the top two patches. i. recognizing that students’ art and design skills at lower and upper grade levels are significantly different, a competition to select a single patch to fly will put the lower grade level participants at a disadvantage. A community might therefore propose one competition at, e.g., grades K-4 and a second competition for grades 5-12.
ii. a cluster of middle schools might be participating in the experiment design competition. One mission patch competition for the middle school cluster makes obvious sense. A second competition for all elementary feeder school students would then provide broader community engagement, and provide a natural link between elementary and middle school audiences. For a community to fly one or two patches, NCESSE requires the community to submit a plan. Your plan should not be longer than a single page. (Most plans are just one or two paragraphs). Note: for a selected mission patch to fly, it must have resulted from a design competition where the expectation is that at least hundreds of students were engaged. Community engagement is a requirement. 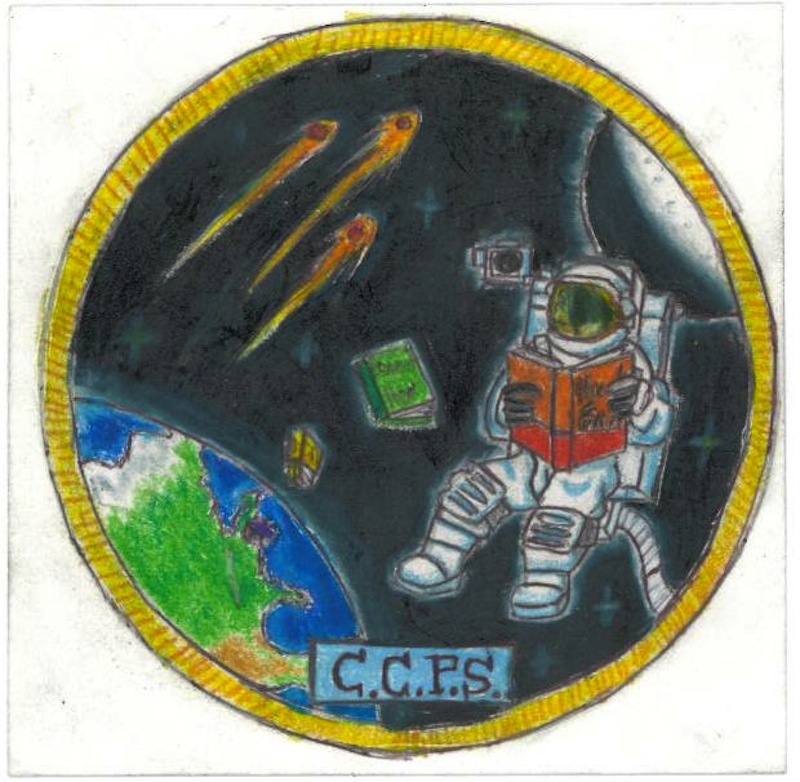 A “One Patch Plan” needs to describe a mission patch competition that has been designed for community engagement, and needs to include the number and grade levels of students that are expected to participate in the competition. A “Two Patch Plan” has the same requirements as a One-Patch Plan, but must also demonstrate how two different groups – through two separate competitions – will be engaged, and how that plan extends SSEP to a wider community beyond those students engaged in flight experiment design. The Two Patch Plan must include the number and grade levels of students that are expected to participate in each competition. We encourage you and your team to think creatively. NCESSE will strive to turn around a review of your plan in 24 hours. Note, however, that the deadline for NCESSE to receive and APPROVE your plan is 5:00 pm ET, October 10, 2014. Since most plans require one or more revisions before approval, it is important to submit a first draft at least a few days before the deadline. Please email your plan to jeffgoldstein@ncesse.org. At right is the selected Mission Patch from Charles County, Maryland, which flew with their experiment on STS-135, the final flight of Shuttle Atlantis, and the final flight of the U.S. Space Shuttle program. Click on their patch to see it up close and personal. See all the Mission Patches that flew on STS-134 (Endeavour), STS-135 (Atlantis), and Missions 1 through 5 to ISS, at the SSEP Mission Patch page, which is found at the separate SSEP Community Network Hubsite. 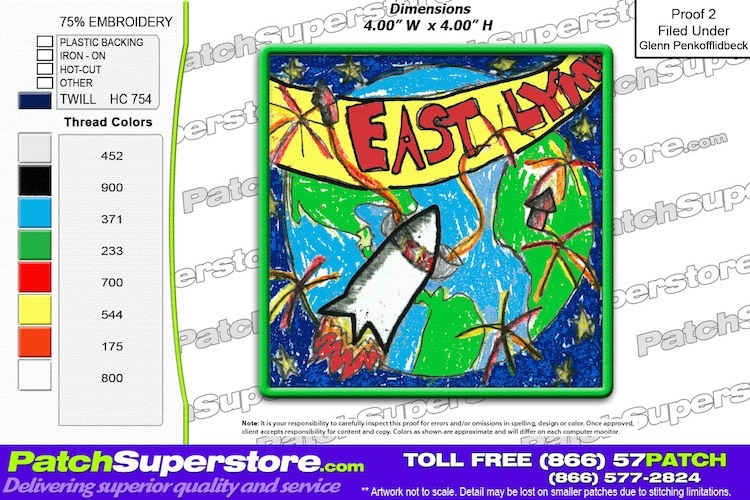 On arrival back on Earth, your Mission Patch(es) will be returned to you for your community to display. It will be a testament to the participation by your students, teachers, and community in the Student Spaceflight Experiments Program, and a truly remarkable student research experience on the International Space Station. 1. A Mission Patch must be a piece of paper NO LARGER than 3.5-inch x 3.5-inch, and its design should reflect pride in your community, and your participation in the SSEP. 2. There is no restriction on the type of paper or the inks to be used. But to fly, it must be paper not card stock or cardboard. Patches submitted on card stock or cardboard will be (and have been) rejected. 3. A Mission Patch can be black & white or full color. 4. A Mission Patch can only be composed of a single sheet of 3.5-inch x 3.5-inch paper and the ink on the paper. 5. A Mission Patch cannot include multiple layers of paper glued or taped on top of one another. 6. 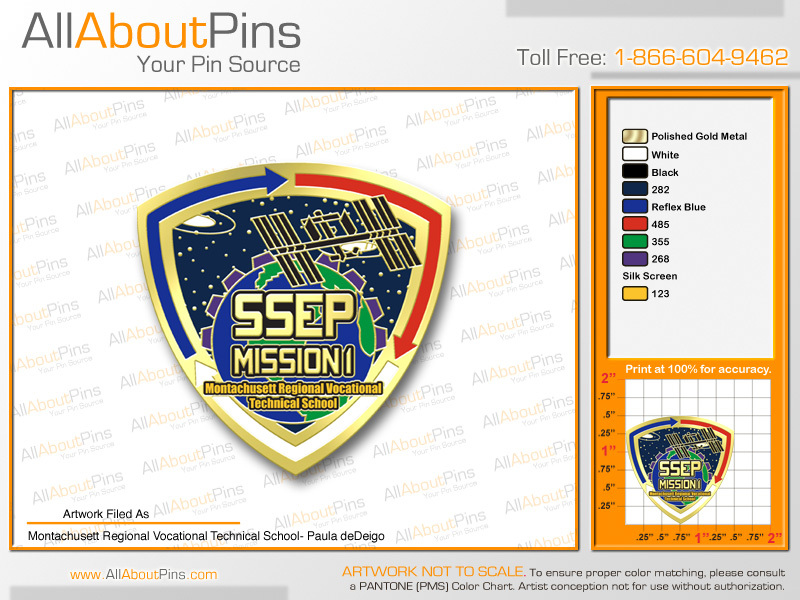 We require a jpg image of each Mission Patch flying so we can display it on the SSEP website. 7. We require a short writeup of your Mission Patch competition(s), which must reflect the Mission Patch Plan you submitted and that NCESSE approved. The writeup must include: the number of students that actually participated in the mission patch design competition(s); the grade levels of the students that participated in the competition(s); and the total number of patches you received from your local competition(s). This description will also be placed on the SSEP website. 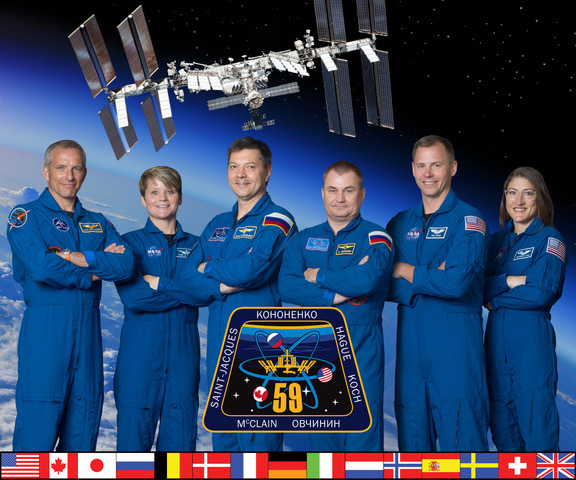 The description can be no more than 150 words (See, e.g., the Mission 5 to ISS Mission Patch page). 8. Your community is responsible for the cost of priority shipment (e.g., FedEx) for: 1) mailing the Mission Patch(es) to NCESSE, and 2) for return to you after the flight. All communities must send their Mission Patch(es) to the address below, and must include a pre-paid priority return mailer, or a FedEx return airbill. When shipping your patch(es) to NCESSE, we strongly recommend using a shipping option that allows tracking of your package. We therefore do not recommend USPS surface mail. Note: the address below is a PO Box. FedEx will not deliver to a PO Box. However, USPS will deliver to a PO Box via, e.g., Priority Mail, or Express Mail. Deadline for NCESSE to receive your Mission Patch(es), jpg images, and writeup of the Mission Patch competition(s): 5:00 pm ET, April 15, 2015. You might even consider selling patches and pins to raise money for a community delegation to travel to the launch and to the SSEP National Conference at the Smithsonian National Air and Space Museum. From the entire SSEP National Team to all the students, teachers, parents, and administrators in your community, have fun with the Mission Patch art and design competition!